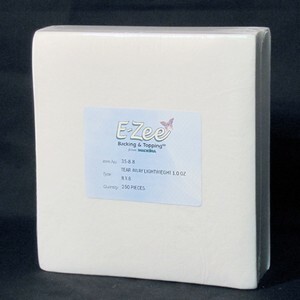 E-Zee Tear® Lightweight 1.0 ounce is a lightweight, Tear Away backing. Use for small designs alone, or in combination with E-Zee Weblon No Show or E-Zee Poly Mesh to added stability when embroidering on performance wear fabrics. Tear Away backings should be used with stable, non-stretchy fabrics. Select a piece of pre-cut E-Zee Tear ® Lightweight to fit your hoop size. Hoop by placing the backing underneath the garment. Embroider the design and remove the embroidered item from the hoop. Carefully tear the excess backing away, to avoid excess pressure on the design. To hoop, place the E-Zee Tear Away Lightweight backing down first, then sandwich the E-Zee Weblon No Show backing in between the garment on top and the Tear Away backing. Embroider the design and remove the embroidered item from the hoop. Tear off the excess Tear Away backing first. Trim the excess E-Zee Weblon No Show backing with scissors.